This beautifully appointed 3 bed/3 bath condo at the luxurious Aspen Lodge, Trappeurs Crossing, comfortably sleeps 10, has two master suites with large private baths and a bunk room. Sip on a glass of wine and enjoy the views of Emerald Mountain and the ski resort from one of the two large covered decks. Sold fully furnished, there's no carpet to worry about, as it's all been replaced with beautiful bamboo hardwood floors. 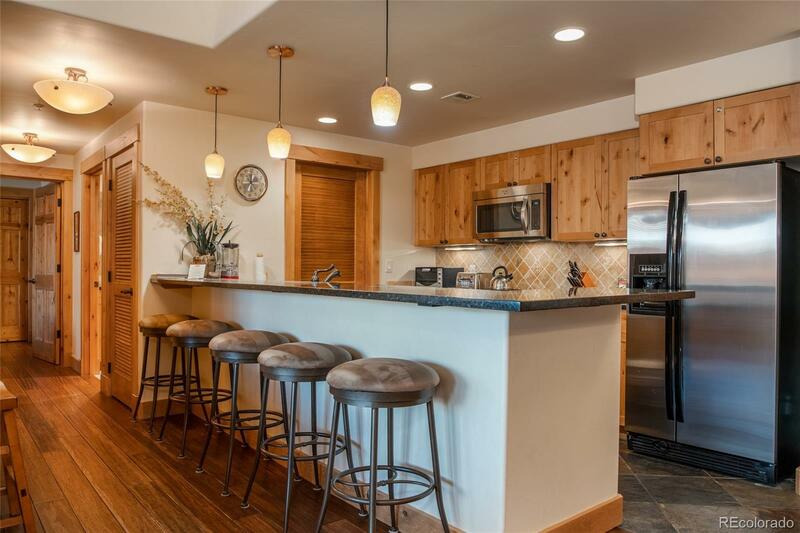 While it's conveniently located only a block from the world-class Steamboat Ski Resort, it also has fantastic amenities that might just make you want to stay at home, including swimming pools, hot tubs, tennis courts, fitness center, outdoor grills, fire pit and clubhouse. Other features include convenient ski lockers, air conditioning, washer/dryer in unit, shuttle service and heated garage with extra storage. See the virtual tour link to "walk through" the condo and for doll house views.